Rodger & Hammerstein's The King and I tells the story of the unconventional and tempestuous relationship that develops between the King of Siam and Anna Leonowens, a British schoolteacher whom the modernist King, in an imperialistic world, brings to Siam to teach his many wives and children. Don't miss your chance to see Rodgers & Hammerstein's The King and I now through December 10 at the Fabulous Fox! Yes, actually! It was on my last tour and we had a lunch stop in downtown St. Louis. I remember waking up from the drive at around noon and being told we were in St. Louis for lunch. If I remember correctly, I had California Pizza Kitchen from the mall. That is the only memory of St. Louis that I have, haha! I have not, but I'm really excited to open this leg of the tour in St. Louis. The first Broadway show I saw was In The Heights back in 2010. It was the first time I had ever been to New York City and my mom was raving about this new, amazing show and that we had to get tickets! It wasn't until the middle of my collegiate career where I knew that I also wanted to perform for a living. I was a double major in Chemistry and Drama at University of California, Irvine. There is a program called The New York Satellite Program - where the school sends over around 30 students to live in New York for a month taking master classes and auditioning. I wasn't entirely sure if performing was what I wanted to do for a living until the NYSP experience. The biggest challenge for me is finding that fine line between playing a child and playing the truth of a child. Prince Chulalongkorn parallels the King's struggles, just as a curious and stubborn teenager. There is so much truth behind these characters and even more in a child. "I believe that children are our future / Teach them well and let them lead the way" -Whitney Houston. 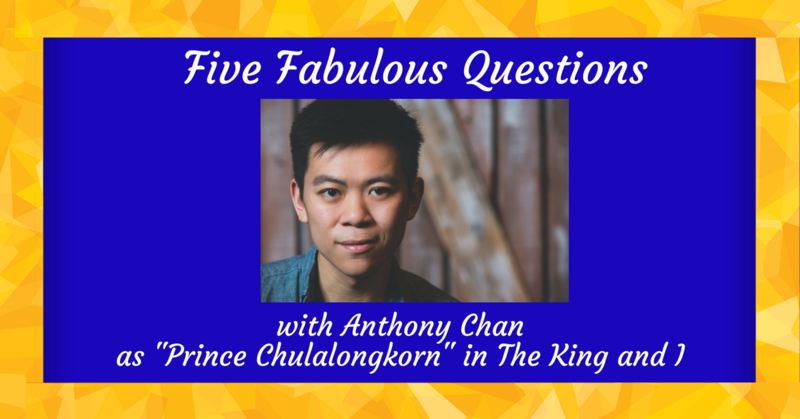 The challenges stem from me being older than Prince Chulalongkorn and having those questions and concerns of growing up. Our director, Bartlett Sher, challenges the company by digging deep into the characters. My advice is to always just go for it - make a goal and once you reach it, set another goal and give it your all. Always trust your instinct because you are the ones that make the final decision of your actions. I was JUST made aware of the City Museum in St. Louis! An adult playground? Sign. Me. Up!